It's often easier to run as part of a group than on your own. Many people make the mistake of believing that when runners never walk. This is not true. It is perfectly acceptable, even encouraged, for runners to walk when they first start. You're much more likely to stick with it, if you start with a run-walk-run approach, and build up really gradually. 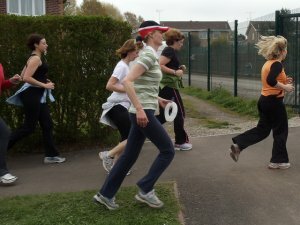 Evidence shows that people who enlist the support of a friend or join a beginners running session, led by an experienced leader, are more likely to stick with it, and succeed long term. JOG Derbyshire is a fantastic programme, with over 80 groups around the county, and a JOG into January campaign every year, which specifically helps people get started from scratch. If you can't find a group near you, or it doesn't work for you, then the NHS Couch to 5k programme is a great way to build up gradually and stick with it for the long term. Following the programme with a friend or partner is good, as again, you're more likely to stick with it if you've told someone what you're doing and even better if you're working on it together. Map my Run, RunKeeper and Strava are 3 great apps for running. Runners World magazine did a review article on running apps, which gives you an insight into the world of online running support. These events take place in pleasant parkland surroundings and they encourage people of every ability to take part; from those taking their first steps in running to Olympians; from juniors to those with more experience; they welcome you all. 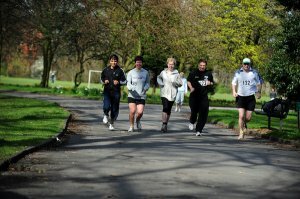 There are a few parkrun and junior parkrun events in Derbyshire, and just over our borders. We are keen to support local groups and clubs to develop more of these events, so please get in touch if you are keen to start one near where you live.